Hang Ten is releasing a new line called the Cotton Project. The Cotton Project explores wardrobe dictations fit for braving the wind chills for the anticipated turn of the season. This new line introduces a mélange of updated looks from tops, jackets and layering essentials catering to the youthful demographic of fashion forward go-getters! In line with The Cotton Project's new theme, Hang Ten prepared a "camping event" for a few of Manila's fashion bloggers to familiarize us with their latest campaign. Bloggers were welcomed with lots of food to provide much needed energy for the games they had planned. 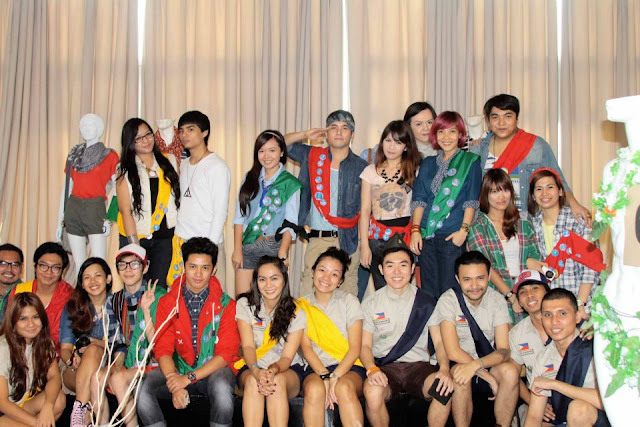 After a bit of snacking, bloggers were divided into color-coded teams to resemeble different camps. We were all given corresponding sashes. I ended up being part of the green team along with Nicole Santos, Aivan Magno and David Guison. "The Camp Grounds" with Adam & Eve looking mannequins care of Mikki Galang. LOL at the flower covered private parts. After which we were given "Survival Kits"
The activities revolved around creating impromptu accessories, styling with cotton project clothes and super fun obstacle courses which was quite a feat for me since I was in wedges which I had to take off midway. It was a really fun, well thought of event. and a group pic of the Happy Campers!